So it’s been five months since my boyfriend and I purchased our Bengal kitten, Nyla and I think it’s time to introduce her to my blogging family. 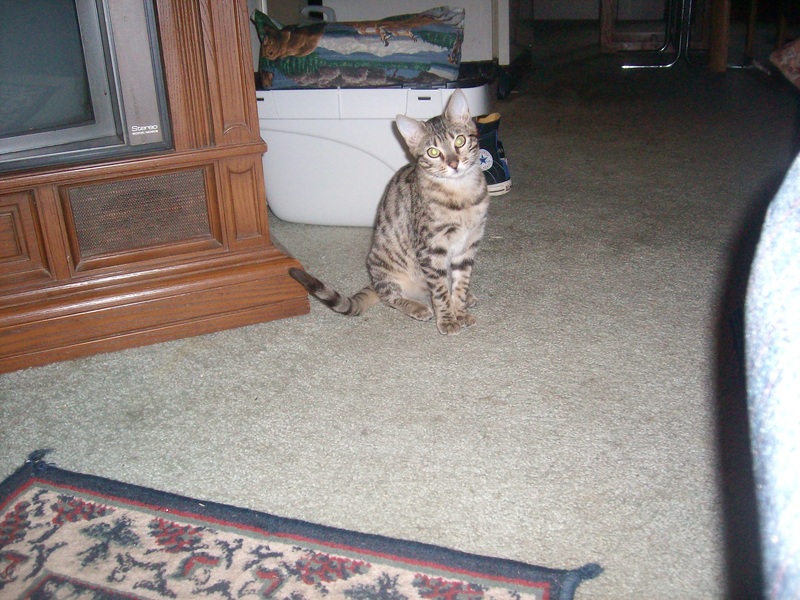 If anyone has questions about Bengal kittens and is thinking about buying one feel free to comment your questions. I may not be an expert, but you learn many things after a few short weeks with this exotic breed. They’re classified as exotic, due to one of the original parents being an Asian Leopard cat (found in the wild of South and East Asia) and domestic cat. 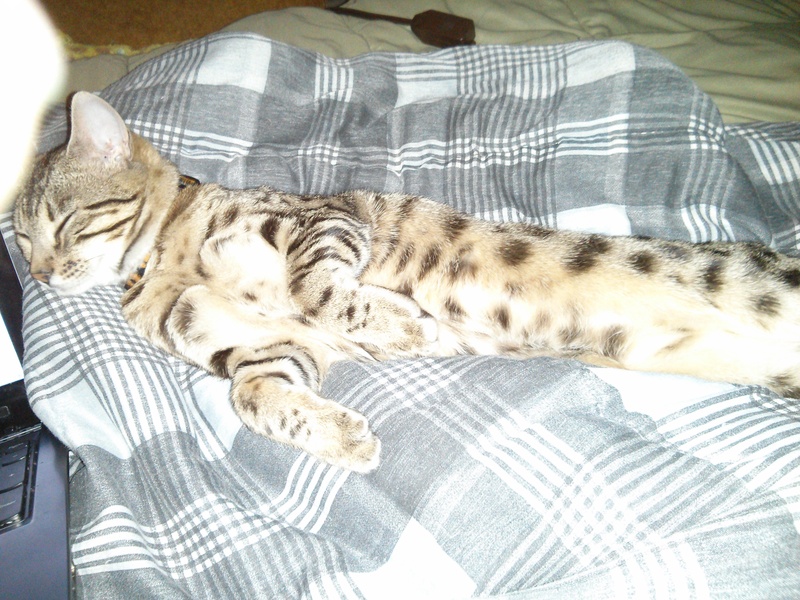 She looks like a normal 22 week old kitten, but now look at her….STILL TINY! At the same time, our little furbaby has grown. The only time she hides from us now is when she needs her kitty time. I love when she crawls onto our laps or snuggles close with us at night because not every cat has to be a snuggler. On the other hand, she cannot stand to be held or confined in any way. As with any animal, she has her personality quirks, and the struggle she provides when trying to hold her is one of many qualities that makes her unique. I must admit that I wasn’t always a cat lover. Although, my dream of owning a snow leopard is as fulfilled as I can get within the limits of the law. If you’re thinking about getting a mini-leopard of your own, be warned that the breed is expensive and high maintenance—ranging from $200-$1,500 for an F4-F2. Seriously, she does! It is a daily activity that if we don’t play enough she will crawl onto our face and play with the toy claws at the ready. 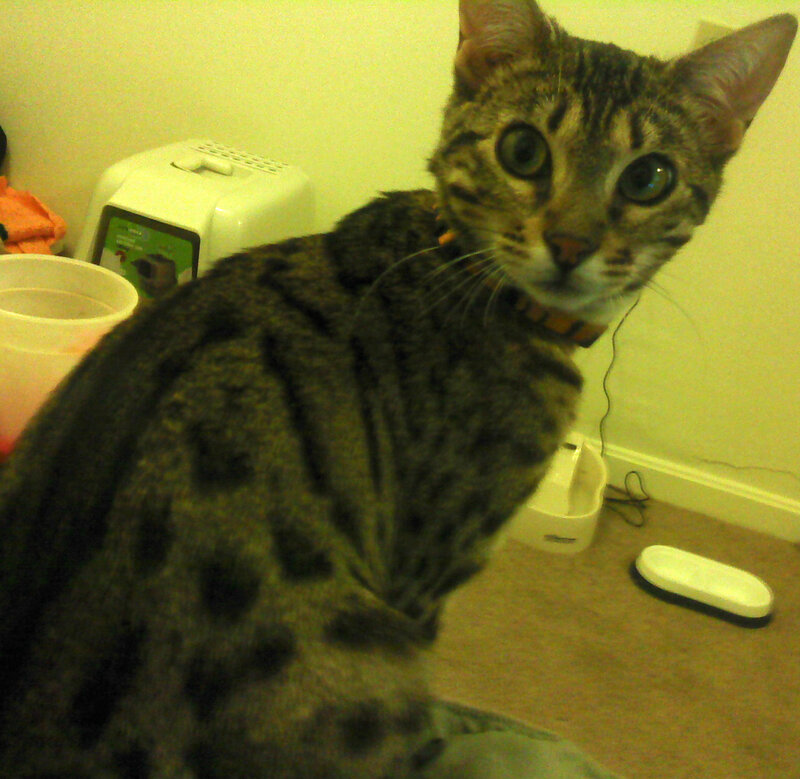 At the end of the day, even after she has clawed my hand to get a toy she is still our crazy Bengal. The breed is naturally more active, never lazy, and in constant need of play time. They are not for the casual pet owner by far and they do not disappoint. 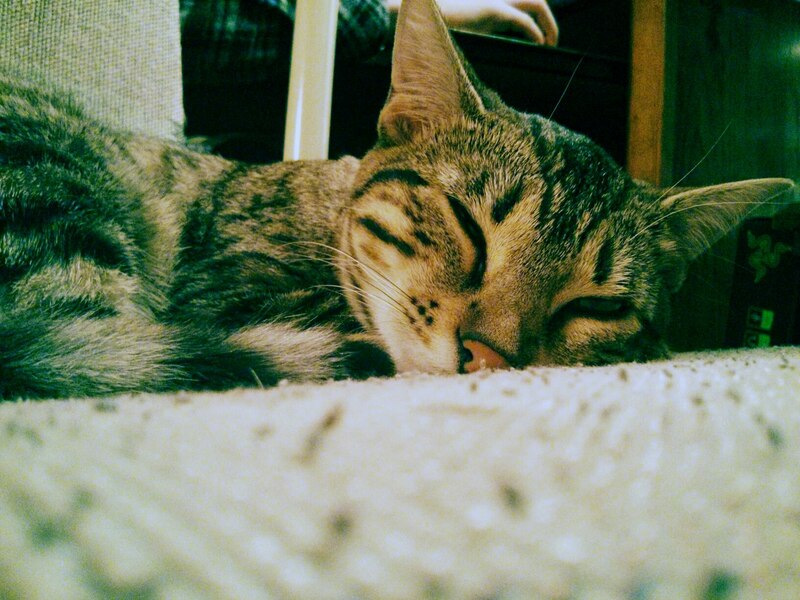 Without futher ado, I give you a slideshow of my precious little monster, Nyla. 🙂 Enjoy your daily dose of cuteness and ferocity. Nyla is my faithful companion, waiting for me by the door and snuggling with me on occasion. She even distracts me from work, so I respond by writing a blog post about her. She depends on me to take care of her, play with her and love her. And I will for as long as I live because I am as responsible for her as I would be a human baby. She could hold her own out in the wild, but a human bred her to be a loving pet and that’s what she deserves. She deserves an amazing, wonderful life filled with fun and games AND TREATS! I’m so happy to introduce you to the leopard of my home. Nyla, Bubbs, Captain Blackpaws, Bubster. She has too many names to keep track of, but we love her under every single one of them. Sadly I can’t have pets in my current house as I’m renting it, but I plan on having pets one day soon! What are you thinking about getting? Hopefully something hearty that can withstand the insane amount of venomous creatures in Australia! But I like all cats. Maybe I’ll get a lion. (kidding).